We are proud to precent the MacBook Wall Desk. Mount it on the wall or use it to raise your MacBook and organise the home office. The design is multifunctional and can be fixed and easily be removed and moved around the house. 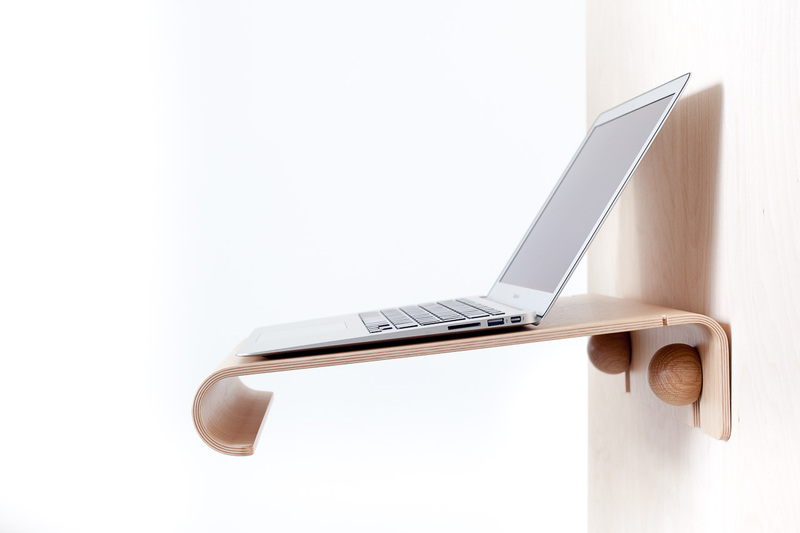 The stand is designed to be a very light workspace in you home or home office. You could have it mounted on the wall in the kitchen to do e-mails or find recipes or you could bring it on the dinning table to work in the evening and organise your thing neatly after work. The design make it possible to use the stand as a wall mounted standing desk where ever you want. You can easily detach the stand and move it around the house. You could bring it to any table in your house to rise the monitor or bring it to the kitchen when finding recipes online. You could also have it mount on the wall in the kitchen to work and bring it on the dinning table to work in the evening and organise your thing neatly after work. The wall stand is made from a core of birch wood and either with oak or walnut on the outer surface. They are equally beautiful but it a matter of taste which wood you prefer. 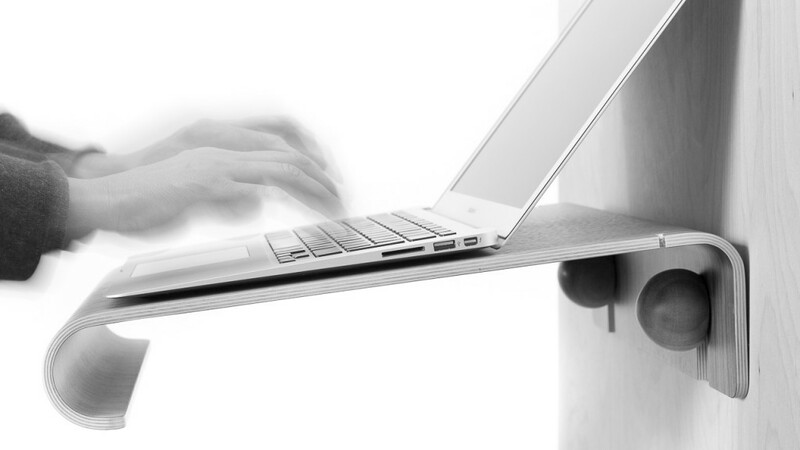 With the wall mounted MacBook desk we have combined the benefits of having a height adjustable table and an ergonomic MacBook stand. 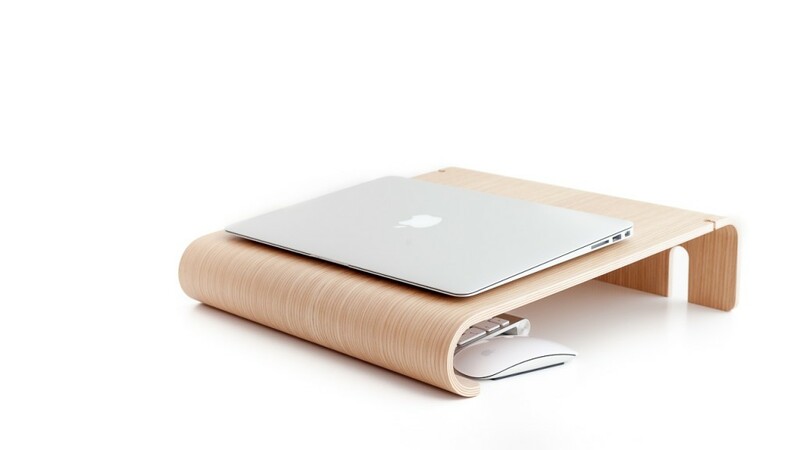 The MacBook Wall Desk is not only meant to be an ergonomically aid it is also eco-friendly. Compared to many other makers we have actually walked the extra miles and made the stand from sustainably forested wood. Actually we only make accessories of wood coming from sustainably forested wood.